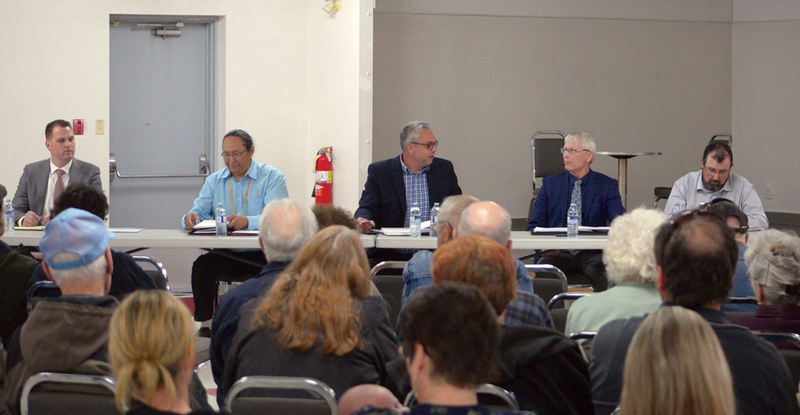 With the provincial election nearing, Cardston-Siksika constituents living in the Vauxhall area were able to hear views and platforms from candidates vying for the MLA job. In an All Candidate Forum hosted by the Vauxhall and District Chamber of Commerce on Monday night, four of the six candidates were in front of a packed Vauxhall Legion Hall crowd. Joseph Schow for the United Conservative Party, Kirby Smith for the New Democratic Party, Casey Douglass for the Alberta Party and Independent Ian Donovan were front and centre for a chance to make points on a variety of issues. Candidates Cathleen McFarland for the Alberta Liberal Party and Jerry Gautreau for the Freedom Conservative Party were not in attendance. The debate started with 12 submitted questions and ended with three questions from the audience. The first question was around how each party would address the deficit Alberta faces. “Our party has laid out a platform to bring investor confidence back to Alberta. Our plan is simple — get people back to Alberta. We will start by attracting businesses back to Alberta by cutting the corporate tax from 12 to eight per cent. That would make it the most competitive corporate tax in the country. Second, we will expedite permit processing times, too much money is held up waiting. Money should be working and paying for labour. The third is scrapping that job-killing carbon tax. Telling people Alberta is a great place to come because you can rely on the government to get out of your way. That is all people really want, so we’re going to do that. We are going to kickstart the economy and by doing that, we will have more people paying taxes in the province to help cut the deficit and balance the budget,” said Schow. The NDP are focusing on diversification of the economy to bring a balanced budget to Alberta. “The current government has dealt with a very tough situation. There was a collapse of oil price. The carbon tax was a way to create a balance and it’s a principle as well. There is a need to have a diversification of our economy with renewable energy and others which is a big part. Instead of making a bad situation worse, we focused on what mattered to Albertans which was job creation, diversification, but still maintaining a focus on health care and education. Right now the province has the lowest debt to GDP ratio in the country. The balanced budget the current government is focusing on over the next few years is for 2022,” explained Smith. Meanwhile, the Alberta Party is planning to bring breaks for small and medium-sized businesses to further promote growth. “We have got many plans to change the equation. One of the plans is to — immediately for Albertan small businesses — to let the deduction limit go from $500,000 to $1 million. Small/medium sized businesses, they get a deduction right away on their second half-million dollars of income that comes in. That will incentivize them to expand their businesses and invest. Combined with that, for child care, we are providing free childcare for the lowest income families. If it is over $30,000 per combined family, then it is $5 per day maximum. That allows single parents to get an education or work,” stated Douglass. Former Little Bow MLA Ian Donovan (Wildrose, PC) promises to look out for the best interest of the riding while also working with the elected party to bring accountability back. Another big issue facing the province is the oil and gas decline. Specifically asked was how the candidates and their parties will approach the federal equalization program when there is opposition to pipelines. Smith says they would be preaching for cooperation and meaningful conversations to come to a solution that will benefit all. Researching a new alternative to ship oil out of province, the Alberta Party has a potentially big idea that would help the oil and gas industry. “We are pro-pipeline but don’t stop there. We also have researched another possibility, but it is not completely researched. It is building a railway line from Fort Mac all the way out to a port in Alaska, bypassing BC and allowing 1 million barrels to flow that way. Part of it is having an adult conversation and saying ‘look, there is a problem and Alberta has been penalized on many fronts so let’s fix the problem’,” said Douglass. With the UCP government promising to not only scrap the carbon tax but also fight a federal carbon tax, Donovan expressed hesitance to that method as he thinks a collaborative approach would be more beneficial. While collaboration and working together was discussed amongst many of the parties, the UCP see the time for playing nice being over as Schow explained Albertans have been on the wrong end of things for the past few years. A question from the audience was around the UCP’s desire to sell crown land. “We have talked about ways of balancing our budget and generate revenue. That is an avenue we have explored but I have also heard from stakeholders in this constituency and across the province. That is the plan moving forward, to consult and to ensure we are finding the most effective ways in this province to balance the budget which is way out of whack and to also make sure we bring investment back. We are going to consult the grazing leaseholders and the agriculture industry to make sure we get this right before moving forward,” stated Schow. While revenue was needed, Smith was hesitant to fully commit to any selling of lands before talking with constituents. The Alberta Party meanwhile has already addressed this in some of their policy. “One sentence — any sales of crown land for agricultural use will be subjected to careful consultation with the agricultural industry, First Nations community and other stakeholders,” explained Douglass. Already having brought up the issue, Donovan once again expressed his concern with the potential UCP policy. Other issues brought forward to candidates included education, renewable energy/non-renewable, canola issues, health care and non-regulated power distribution and transmission costs.